Flying activity on a Sunday as well! 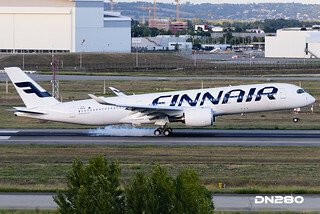 Finnair announced today that they will receive their 1st A350 on the 7th October, slightly later than planned. Hence a bit of overtime at Airbus? Information provided today about the latest movements in the A350 production cycle today from photos by Jujug Spotting and Jérémy Le roch. As tweeted by Finnair, MSN 019 has now been painted in OneWorld colours and was seen on the stands near the A380 plant today. MSN 026 the first for Singapore Airlines was also moved to be parked near the A380 production halls today. In one photo Jujug Spotting confirms that msns 019, 23, 25 and 26 are currently parked outside at this location. Clément Alloing posted a photo this morning of msn 019 on its way towards the A380 production side of the field (JLL – J.L. Lagardère). At this stage it is not clear if it is going for further work in a spare hanger or into paint. 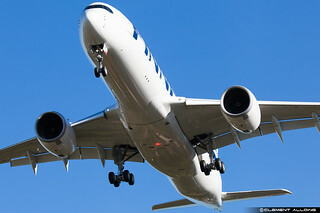 MSN 019 is expected to carry test registration F-WZFN before being delivered to Finnair as OH-LWB. Update: In a later photo posted by A380_TLS_A350 we can see that msn 019 is using one of the tent structures built near the A380 prod halls. 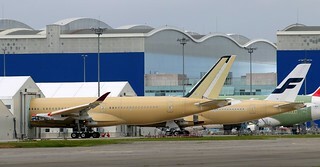 The photo also shows msn 12 F-WZFG / A7-ALG being worked on partially under cover. 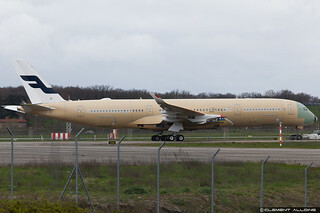 F-WWCC / ZZ342 A330MRTT for RAF is not fully painted in the normal yellow primer, and I guess off to get engines. Fuselage sections for the second @Finnair #A350 (MSN19) are being delivered to the final assembly line in Toulouse.